Far more respondents in Greece (87%) than in Western Europe (57.9%) said that domestic B2B customers pay invoices late due to liquidity issues. Consistent with last year’s survey findings, respondents in Greece continue to show a great openness to granting trade credit in business-to-business (B2B) transactions. Unlike last year, however, Greek respondents appear to be much more likely to request payment methods from B2B customers which do not expose them to payment risk. This is not surprising for a country where a further 5% increase in business failures is forecast for this year. 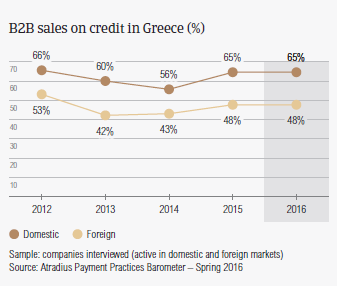 Evidence of this more risk-averse behaviour of Greek respondents can be seen in the considerable decrease in the proportion of B2B sales made on credit over the past year. This decreased to an average of 56.5% of the total B2B sales value (average for Western Europe 41.2%), from 65.1% one year ago. Despite this considerable reduction, Greece stands out as one of the most inclined countries in Western Europe, along with Sweden and Denmark, to use credit terms in B2B trade. Unlike respondents in Sweden and Denmark, who show an almost uniform perception of payment risk arising from domestic and foreign B2B trade, Greek respondents, like respondents in Italy, are much more trade credit friendly with domestic customers than with foreign customers. 64.6% and 48.3% of the total value of domestic and foreign B2B sales respectively were made on credit (survey averages: 44.8% domestic and 37.7% foreign). 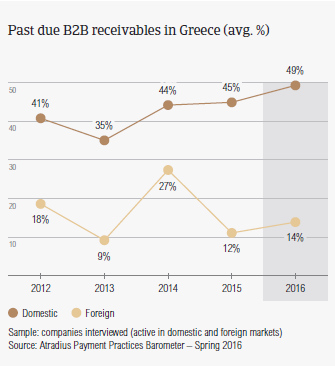 Nearly 63.0% of the respondents in Greece experienced late payment of invoices by B2B customers over the past year (respondents in Western Europe: 88.0%). This resulted in an average of nearly 32.0% of the total value of domestic and foreign B2B receivables remaining unpaid past the due date (average for Western Europe: nearly 40.0%). The payment default rate recorded in Greece is notably lower than the average for Western Europe. This may be due to the considerably lower proportion of invoices defaulted on by foreign customers (14.0%) than by domestic customers (49.1% of the total B2B credit sales value). This reflects the much higher level of insolvencies in Greece than in the majority of the countries in Western Europe. Over the past year, moreover, domestic default rates in Greece were twice as high as those in foreign customers. Late payment of invoices (domestic and foreign) is reflected in the Days Sales Outstanding (DSO) figure posted by respondents in Greece. This averages 53 days (survey average: 48 days) and is nearly two weeks shorter than last year. This may reflect greater efficiency in collecting high value invoices. Fewer respondents in Greece (57.8%) than in Western Europe (63.7%) expect no change in DSO over the next 12 months. A worsening in DSO is expected by nearly 22.0% of respondents, in line with the survey average. As Greek businesses are very exposed to domestic payment risk, protection of business profitability implies being confronted with a number of challenges this year. The biggest one is considered collection of outstanding invoices, which, on average, worries more respondents in Greece (17.5%) than in other Western European countries (11.9%). Payment terms extended to B2B customers by respondents in Greece average around 44 days from the invoice date, and are markedly above the average for Western Europe (31 days). Domestic customers of Greek respondents enjoy the most relaxed payment terms in Western Europe. Foreign customers are requested to settle invoices on average one month earlier than domestic customers. This may suggest that Greek respondents offset the high level of domestic payment default with swifter payments of foreign customers. Over the past year, however, both the average domestic and foreign payment terms have tightened up by an average of nine days. This may be read as an attempt of Greek businesses to balance out their tight financial conditions. 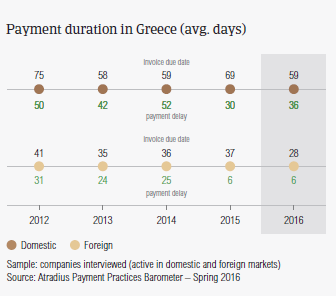 B2B customers of Greek respondents settle past due foreign payments on average in 5 days and domestic payments in 36 days after the invoice due date. This means Greek respondents turn domestic past due receivables into cash, on average, nearly 100 days from invoicing (survey average: 53 days). Foreign invoices take roughly two months less time. This corroborates the assumption that Greek businesses benefit from the swifter payment practices of foreign customers. 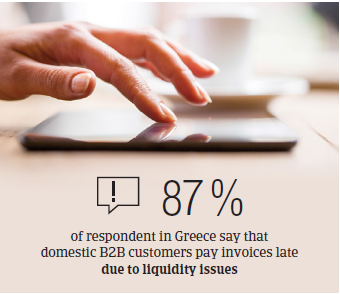 Based on what was observed earlier, it is not surprising that far more respondents in Greece (nearly 87.0%) than in Western Europe (57.9%) said that domestic B2B customers pay invoices late due to liquidity issues. This has not changed significantly compared to one year ago. Contrary to the survey pattern, the second most often cited reason for late payment of domestic invoices is not the intentional use of outstanding invoices by customers for their financial advantage but the inefficiencies of the banking system. This was cited by more than twice as many respondents in Greece (26.0%) than in Western Europe (12.5%). Greek respondents most frequently attributed late payment of foreign invoices (50.0%) to liquidity constraints of customers (respondents in Western Europe: 40.2%). The complexity of the cross-border payment procedure is also a reason for foreign payment delays that respondents in Greece (33.3%) experienced more often than respondents in Western Europe (28.0%). More respondents in Greece (51.0%) than in Western Europe (42.1%) reported no significant impact on their business as a result of late payment of invoices by customers. Despite this, 29.0% of respondents in the country (18.8% in Western Europe) lost revenues, and 24.8% (18.3% in Western Europe) had to take specific measures to correct cash flow. The proportion of B2B receivables, reported by Greek respondents as uncollectable, is on average three times higher than that at regional level (3.6% of the total B2B credit sales value, versus 1.3% in Western Europe). 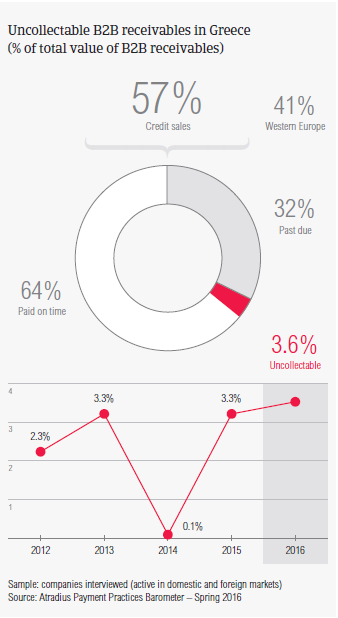 Uncollectable receivables consisted almost entirely of domestic write offs. Uncollectable domestic B2B receivables originate most often from the consumer durables and food industries. For far more respondents in Greece (51.2%) than in Western Europe overall (28.6%), B2B receivables were uncollectable mainly due to the failure of the collection attempts. 26.3% of respondents in Greece (19.7% in Western Europe) wrote uncollectable receivables off mainly because they could not locate the customer. Survey respondents in Greece reported granting trade credit terms mainly to B2B customers in the consumer durables, food and chemicals industries. Invoice payment terms extended by Greek respondents to B2B customers in the chemical and consumer durables industries are significantly longer than the country average (averaging two months from invoicing). B2B customers in the consumer durables sector settle overdue invoices the slowest (over two weeks after the due date). An above average (for the country) proportion of overdue invoices was generated by the food industry. According to most of the respondents (96%) this is likely to be chiefly due to liquidity constraints of customers in this industry. 61.0% of the respondents in Greece expect payment practices of B2B customers in the food industry to deteriorate significantly over the next 12 months. 54.0% of respondents forecast a worsening of payment practices in the consumer durables industry over the same time frame. No significant change is anticipated in respect to payment practices of other industries.